The 4-year-old will remain unseen for this post. You see, he and I were in a fight this week. You would think the fun and flirty 30-something could handle a little one with limited verbal skills. Umm...no. What was the source of our conflict? It was huge...it was dinner. 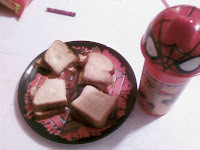 I slaved over a PB&J sandwich (minus the PB, per his request) and poured a nice cold cup of milk. I asked him if the amount of jelly was enough, how he wanted me to cut the sammie, and what cup he would like for his drink. He made every decision. Including the one where he pushed it away and said he wanted chicken nuggets. He argued he needed "brain food." After discussing the nutritional intricacies of the meal I'd prepared and him remaining unconvinced, I said "Billy, you can eat the sandwich or not - but it's all you're gonna get." The argument then dissolved into back and forth verbal taunts until I actually heard myself say "Nuh-uhh." When did I revert to 5-years-old? I suppose the moment I entered into a power struggle with a toddler. I finally chose to resolve the matter in the healthiest and most approriate manner. I took a deep breath and simply said "I'm tellin'." 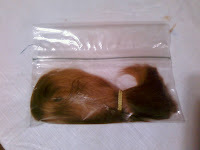 Yes, this is her hair in a plastic storage bag I found on their kitchen counter. 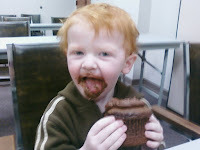 One of the first rules that parenting people tell you is not to argue with a 4 year old. You just end up feeling stupid. But Billy is easy to argue with. He is his mother warmed up and served small. Billy is really interested in his brain right now. He told Bill that he had a really big brain and there was a lot of stuff up there. I am very disturbed about the hair in the bag..? You make me laugh. ha ha. Did you really call yourself fun and flirty? I can deal with fun, but you are a terrible flirt. That's why you're still single and keeping other people's babies instead of making your own. Joseph - Billy IS his mom. The Sextons - me too. I babysat yesterday and saw that sitting on the counter! It freaked me out for a second and then I realized what it was. She does have beautiful hair... but geez. AND OMG! Caryann just brought it! One day that lovely ponytail in a bag will go to Locks of Love. I've been waiting to be able to use my printer and get back on the internet. Now that all is well, we'll see how much longer that task will take.